If you're a training administrator you may have noticed that we've been pretty busy over the last few months with a raft of significant changes to the LMS to help make managing and assessing your workplace training as simple as possible. Sometimes when we push a bunch of big updates it's easy for us to overlook the little changes that make a big difference so this Friday I thought I'd give a little stage time to a couple of new actions which are available to you now in the LMS results view. What do you do when someone has failed their training? 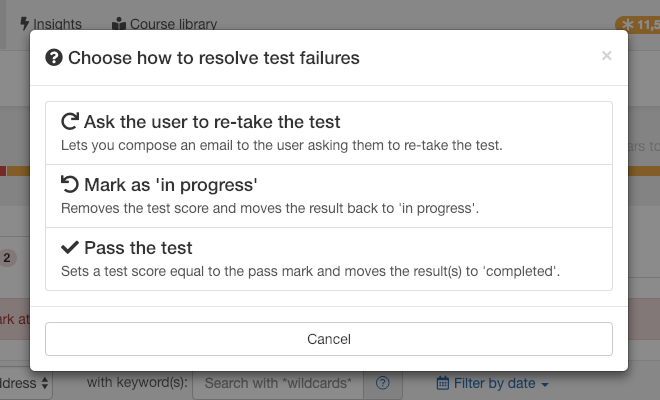 Up until recently you'd have to manage that outside of the LMS but you can now select one or more failed results and choose how to resolve them. You can pick from three possible outcomes; Ask the user to re-take the test, Mark the result as in progress (and clear the test attempt) or Mark the test as complete. Just select the result(s) in question and pick 'Resolve failures' from the action menu. In the real world not all users have the same training needs. You might want to impose more frequent training renewals on your management team or require that staff renew certain courses when they move roles or desks. 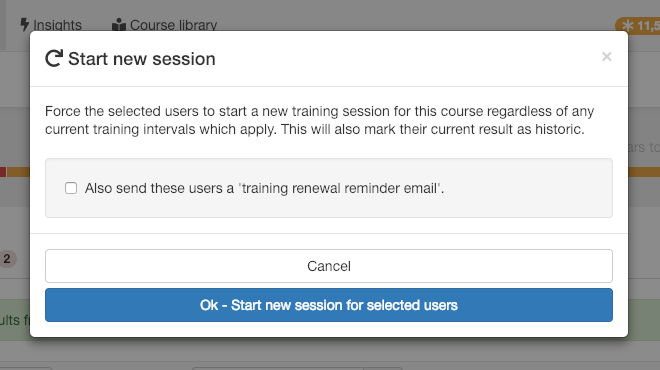 In the LMS you can now force a user to start a new training session for a course they already completed regardless of that courses training interval. Just select the result(s) in question and pick 'Start new session' from the action menu. This will archive the selected result(s) for this course and optionally send the associated users an email to remind them to renew their training. We hope you find these new features helpful. If you want the inside line on the latest changes 'as they happen' then just subscribe for email or RSS updates on future releases and we'll keep you informed.